The fine arts (dance, music, theater and visual arts) play a unique and central role in the educational experience. The arts are essential to education as independent disciplines, and also furnish the ideal avenue for significant interdisciplinary experiences. The arts enable students to explore and refine their innate creative and intellectual abilities. Dance, music, theater and visual arts provide opportunities for expression of emotion and ideas, and develop student’s sensitivity to the expression of others. The arts provide a balance among verbal, analytical and intuitive experiences, while promoting an awareness and appreciation of cultural and historical diversity. The act of making art fosters creative thinking, problem solving, self discipline, self awareness, self esteem and interpersonal skills. The arts broaden the range of possible career opportunities. Preparation in the arts enables students to understand and participate fully in them, and to make informed aesthetic choices throughout their lives. In our highly technical and rapidly changing society, the arts remain a constant link with the past, help in understanding the present and establish a path to the future. Painting students have been very busy learning and experimenting with the techniques of watercolor. Students started the year by learning about color. They learned how to add depth to the pictures by creating atmospheric perspective. They became familiar with the importance of changing shapes to forms by adding value. Next, they moved on to using a wash technique with hard and soft edges to create jellyfish paintings. They will explore various landscape designs and create final painting. Drawing students started the school year by exploring the use of VALUE. They are discovering how adding lights and darks to their pictures will completely change the result. Students have been working on observational drawings of apples. They explored various techniques of drawing from blind contours, gesture and upside down drawing. The subjects have ranged from apples, glass bottles, sneakers, and backpacks. They have studied line and the created camouflage drawing where they use line to hide an original strip of paper. Transportation and antique bicycles are the subjects of our latest drawings. These students have had the entry levels classes and are ready to learn advanced skills in the arts. We are pushing creativity as they create creatures with a mixture of 3 different animals into one. Students have been introduced to JUXTAPOSITION and used their imagination and drawing/painting skills to realistically put a jelly fish in an unlikely situation. They are becoming more familiar with portrait drawing and creating character eyes. This will help set the stage for the MEMORY PROJECT where the create portraits of orphans in Ethiopia. Students continue to expand their understanding of the Elements and Principles of Design by effectively incorporating them in their projects. Art projects alternate between projects based on skill based inquiry and works inspired by student’s ideas, experiences and themes of personal expression. As the semester progresses, students become increasingly capable of seamlessly integrating these components into their work. Students are increasing their knowledge of Photoshop and the myriad of tools it contains by creating digital collages. Student’s collages must demonstrate understanding of the Elements and Principles of Design while incorporating personal messages and increasing mastery of tools. Students have been working on projects that also incorporate art history, including Pop Artist Andy Warhol. Student work can been seen on the multiple Pinterest Boards where they have created digital portfolios. The secondary English program at Hamden High School is divided into two phases. Grade seven through ten emphasizes acquisition and development of skills; grades eleven and twelve, their application and refinement of skills. English teachers can provide students with guidance regarding course and level placement. In the Hamden High School mathematics program students will participate in a sequential course of studies that is consistent with the Connecticut Mathematics Curriculum Framework. Our program prepares students for post-secondary success by developing the major concepts and skills of numeracy, algebra, geometry, measurement, probability and elementary statistics which must be acquired before entering college or the workforce. In addition to the core algebra I, geometry and algebra II courses, students may choose from a variety of mathematics elective courses. Electives include advanced algebra, trigonometry, pre-calculus, calculus, multi variable calculus, two Gateway Community College aligned classes (one of which you can possibly earn college credit) and Mobile APP Development. The department offers three Advanced Placement courses: AP Statistics, AP Calculus AB and AP Calculus BC. In all courses, students use the latest technology tools, including graphing calculators, computers, interactive and digital displays to develop an understanding of concepts and an appreciation of mathematics and how it is used to solve a wide range of problems. Aaron Barkon teaches Orchestra, Band, Music Technology, and Music Theory. He also directs the Marching Band, Jazz Band, and the Mainstage Pit Orchestra. Call 407-2040 ext.3613. Stephen Baranski, Ph.D. teaches Music Theory, Piano Lab, Music Technology and Chorus. He also directs the Chamber Choir and is the Musical Director for the Mainstage Productions. Call 407-2040 ext.3613. Katherine Socha teaches instrumental music lessons, music theory, and music technology. The Hamden High School Music Department is a comprehensive music program. The curricular programs include two concert bands, a string orchestra and a concert chorus. The extra-curricular ensembles include marching band, chamber chorus, jazz big band, and jazz combo. The music program also collaborates with the theater department to produce their spring musical. 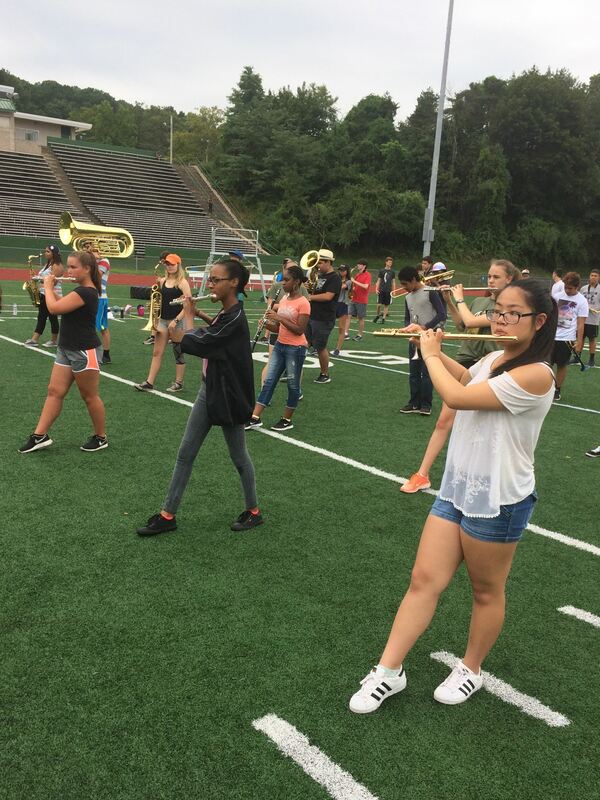 In addition to the academic ensembles, the HHS music program offers many music classes including music theory, music technology, and piano lab. As with performing ensembles, the classroom music program works tandem with the theater department in Musical Theater class. The HHS physical education program includes a planned sequential curriculum that is designed to build on the concepts taught in the lower grades. The goal is to ensure that all students know how to maintain a healthy lifestyle, including knowledge of the importance of fitness activities and making appropriate choices. Activities include fitness units, individual and team sports and racquet sports. The goal of health education is to develop the kind of personal behavior that will contribute to positive health choices in each individual. Units of study include: disease prevention, nutrition, growth and development, substance abuse, safety and first aid, family life, mental health, consumer and community health. Health education is required of all students in grade 10. An elective senior health course is also available. Substance abuse is taught in grades 9, 11 and 12. Please note: Skating is required in grade 9 and swimming in grades 9 and 10. There may be variations in activities offered during PE units depending upon facility availability. The Science program for Hamden Public Schools is comprised of a comprehensive curriculum, designed for coherence and competence as students continually build on important science and engineering ideas and practices as they advance from Kindergarten through high school. By the time students enter Hamden High School, they will have already worked within the realms of all major disciplinary core ideas, cross cutting concepts and science and engineering practices defined by the NGSS. The goal of the high school program is to refine and advance all of the above through a sequence of core courses and rigorous electives. All science courses offered at Hamden High School are at various stages of revision in order to align with the Next Generation Science Standards (NGSS), adopted by the CT Department of Education in 2015. For a brief overview of the NGSS, including implications for teaching and learning, please click here. The lists below include those courses currently offered at HHS. All are offered at more than one academic level. Students need a total of three credits to graduate. The following full year courses culminate with the national Advanced Placement exam in May, which may afford students college credit. The Social Studies Program is designed to prepare students to take an active role in the affairs of their local, state, and national communities. It explores the traditions and ideals of our nation and its relationship to the world. The department focuses on the process of making rational decisions based on facts gathered through research, the rules and responsibilities of a just society, the importance of economic and geographic relationships, and the richness and diversity of our history. The social studies program will provide students with the knowledge, skills, and means to appreciate the importance of the past, the complexity of the present, and the challenge of the future. Hamden Public Schools offers 5 languages: Italian, Latin, Mandarin Chinese, Spanish, and Spanish for Heritage/Native Learners. Our curriculum is based on the World Language Readiness Standards and focuses on literacy, real-world applications of language, and 21st century skills. World Language Teachers strive to conduct classes in the target language 90-100% of the time, use authentic cultural texts, and design communicative activities to push students toward achieving higher proficiency levels. Learning languages prepares us to connect in the multi-lingual and multiple-cultural world we share. Language proficiency refers to what students can do with the language in terms of speaking, listening, reading, and writing in a real-world context, and to what degree. Levels of proficiency are described along a continuum beginning with novice and progressing through intermediate, advanced, superior and distinguished as described by the American Council on the Teaching of Foreign Languages (ACTFL). ACTFL’s Can-Do Statements guide language learners to identify and set learning goals and chart their progress towards language and intercultural proficiency.